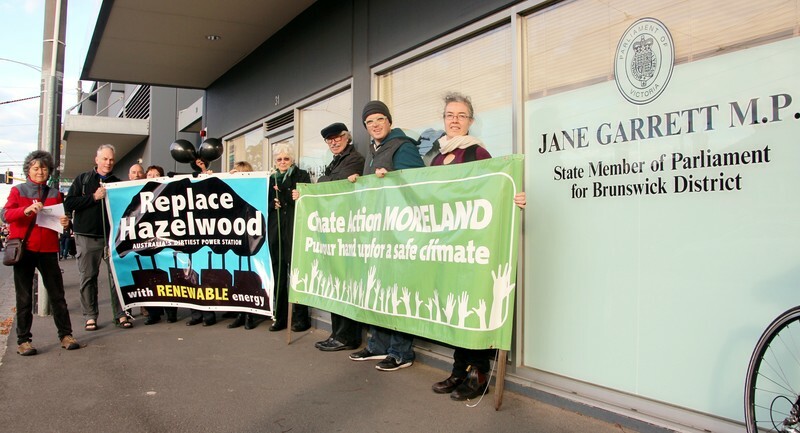 Our visit to Jane Garrett MLA, member for Brunswick, was our third state MP we have visited that represents the Moreland Municipality, to raise the necessity and importance of closing Hazelwood and a community transition plan. People in Moreland Call on Jane Garrett MLA to Act Now. Climate Action Moreland urges local MPs to support strong action now to close Australia’s dirtiest power station, Hazelwood. We had about 30 people turn up to our vigil at the intersection of Nicholson St and the Capital City Trail bikepath. “Great support this morning from cyclists as we bring awareness to the urgency of closing Hazelwood, before visiting our local MP Jane Garrett on our quest to ‪#‎replacehazewood‬.” said Bronwyn Plarre. Indeed, many cyclists took a leaflet and some volunteered to be photographed with a sign. Preaching to the converted? maybe. But many of these cyclists are Jane Garrett’s constituents, concerned about climate change and the necessity for closing coal emissions and transitioning to renewable energy. At the end we will be walking up to Jane Garrett’s office to hand over a formal letter. If your cycling to school or work, chat with us for a while or hang around and come with us to deliver the letter to her office. Our climate is getting more extreme and unpredictable, with more intense heat waves, more menacing bush fires, and more disastrous and costly weather events such as Superstorm Sandy in north-east USA and Typhoon Haiyan in the Philippines. Climate change activists will visit Jane Garrett MLA for Brunswick, from 8am, Thursday 28 May where constituents will deliver her a letter calling for urgent replacement of the world’s third dirtiest power station. CAM has welcomed the moves by the the Victorian Government to relax the laws on wind farm developments and the fact that it will re-open the Hazelwood Mine Fire Inquiry. CAM has also been encouraged by recent proposals to examine Victoria’s future with regard to energy efficiency, climate change and renewable energy. During the unprecedented Black Saturday bushfire period, there were 180 extra heat-stress-related deaths in Victoria, an average of more than two deaths for each electorate in Victoria. This is just one way climate change is affecting constituents right now, with many more severe impacts that will affect Victoria’s rainfall and food-growing capacity, worsen bush fires and inundate coastal areas. The need to move quickly to replace dirty coal with clean renewable energy and jobs was highlighted in a new report from Oxford University’s Stranded Assets Programme, which identified the most-polluting, least-efficient and oldest “sub-critical” coal-fired power stations. The report found 89% of Australia’s coal power station fleet is sub-critical, “by far the most carbon-intensive sub-critical fleet in the world. CAM is urging the development of a strong jobs package and an economic transition plan for the Latrobe Valley because the move from coal to clean wind and solar renewable energy is now both urgent and inevitable. Entry filed under: campaigns, Hazelwood, Meet Climate Action Moreland members, Politician education, rallies & protests, Repalce Hazelwood, Replace Hazelwood. Tags: coal, Hazelwood, Jane Garrett.